I spent the last few days at a technical workshop where I spoke about Agile and DevOps and while preparing my talks I did a bit of reflection. What I realised is that my story towards my current level of understanding might be a good illustration of the challenges and solutions we have come up with so far. Of course everyone’s story differs, but this is mine and sharing it with the community might help some people who are on the journey with me. When I joined the workforce from university and after doing some research into compilers, self-driving cars and other fascinating topics that I was allowed to explore in the IBM research labs, I was immediately thrown into project work. And of course as was custom I went to corporate training and learned about our waterfall method and the associated process and templates. I was amazed, project work seemed so simple. I got the methodology, processes and templates and all I have to do was following them. I set out to master this methodology and initial success followed the better I got at it. I had discovered the “recipe book” for success that described exactly how everyone should behave. Clearly I was off to a successful career. All was well, until I took on a project for which someone else created a project plan that saw the project completed in 12 weeks’ time. I inherited the project plan and Gantt chart and was off to deliver this project. Very quickly it turned out that the requirements were very unclear and that even the customer didn’t know everything that we needed to know to build a successful solution. The initial 4 weeks went by and true to form I communicated 33% completion according to the timeline even though we clearly didn’t make as much progress as we should. Walking out of the status meeting I realised that this could not end well. I setup a more informal catch-up with my stakeholders and told them about the challenge. They agreed and understood the challenge ahead and asked me what to do. Coincidence came to my rescue. On my team we had staffed a contractor who had worked with Agile before and after a series of coffees (and beers for that matter) he had me convinced to try this new methodology. As a German I lived very much up to the stereotype as I found it very hard to let go of my beloved Gantt charts and project plans and the detailed status of percentage complete that I had received from my team every week. Very quickly we got into a rhythm with our stakeholders and delivered increments of the solution every two week. I slowly let go of some of the learned behaviour as waterfall project manager and slowly became a scrum master. The results were incredible, the team culture changed, the client was happier and even though we delivered the complete solution nowhere close to the 12 weeks (in fact it was closer to 12 months), I was convinced that I found a much better “recipe book” than I had before. Clearly if everyone followed this recipe book, project delivery would be much more successful. 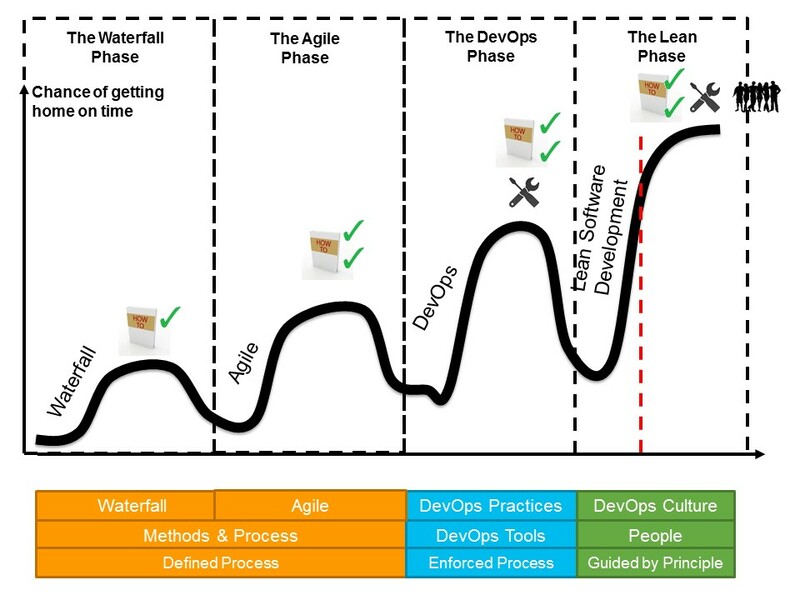 The good news is that many of us are on this journey together, and I am confident that on the back of the great results we achieved with tools and methodology alone, truly great things lie ahead of us still as we master the cultural transformation towards becoming DevOps organisations. This entry was posted in Agile, DevOps and tagged agile, devops on August 14, 2015 by Mirco Hering. Hi Mirco! Hope you’re doing well mate, I like this blogpost. What I’m finding these days is I’m typically sent in to a team to “sort out there architecture/technical practices” and what I end up doing is applying lean practices to help them to identify, measure and reduce the waste in their business first. Then, and only then do I worry about what is needed to optimise it as far as technology is concerned. I’m finding this is a far more collaborative process, by gathering the data first it means whatever proposals we make are based on data- that everyone helped to contribute to. I’m finding this a much better process than either waterfall or agile methodologies- of course this isn’t exclusive, we can still solve the problems identified with either agile or waterfall, I find lean practices are far more effective as analysis rather than jumping in to solution from the start which seems to be the industry standard these days.